Toensing lists his birth year as 1846 but that cannot be correct because he would have only been eleven when he was elected to the Senate. A death date cited from a Shakopee Argus obituary (http://www.edenprairiehistory.org/EPHistory/SA61-26.TXT) lists a death date for a Richard G. Murphy as being January 14, 1875 and lists his age as 74. His revised birth date seems more likely and is derived from that death date. Murphy's Landing in Shakopee is named for him. Leadership Notes: He was President of the Senate until June 3, 1858; when Lieutenant Governor William Holcombe took office and assumed the position. 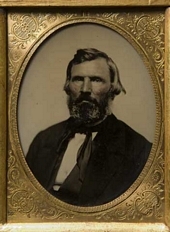 Leadership Notes: The General Laws of Minnesota, 1858 list him as President Pro Tempore.